Are you on a budget and looking for cheap treadmills under $200? Well, we’ve reviewed the best options available on the market. By the end, you’ll have a clearer idea of the features, benefits, and disadvantages that each one has to offer. Have a read below to learn more! 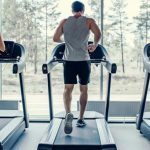 When it comes to picking the best treadmill for home use, companies have been including more and more technological features, at a lower price. However, we recommend not focusing solely on the advanced features available. We say this because you need to have the basics first. 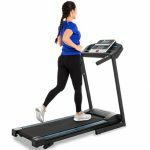 In this section, we’re going to take you through the main features that you should consider prior to purchasing any treadmill. Consider how you’re mainly going to be using the treadmill. If your main form of exercise is intended to be walking or jogging, a treadmill that has a horsepower of around 1.5 will work well. However, if you’re looking to run at a faster pace, you’ll benefit more from a treadmill that’s backed by 2.0 horsepower or more. Not all cheap treadmills under $200 come with a huge range of workout programs. Although, it’s always handy having at least a few that you can rely on. The workouts are pre-programmed and can help you reach your fitness goals. Regardless of whether it’s to lose weight, improve your cardiovascular health, and become faster. If you’d rather manually set your own workouts, the pre-programmed options aren’t going to something you need to consider too much. The treadmill belt is an area that many users run into problems with. One of the main reasons being that they haven’t picked the best treadmill belt for their uses. If you’re looking to walk or jog, a belt that has a length of between 45 and 50” will suit you well. Runners should look for belts that are between 55 and 60” long. Moreover, if you’re taller, a longer belt would be best. 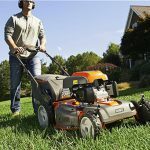 It allows you to take larger strides more comfortably. The width of a treadmill belt is just as important. For runners, we advise sticking with belts that are a minimum of 22” in width. This provides you with the extra room that you need to run safely. 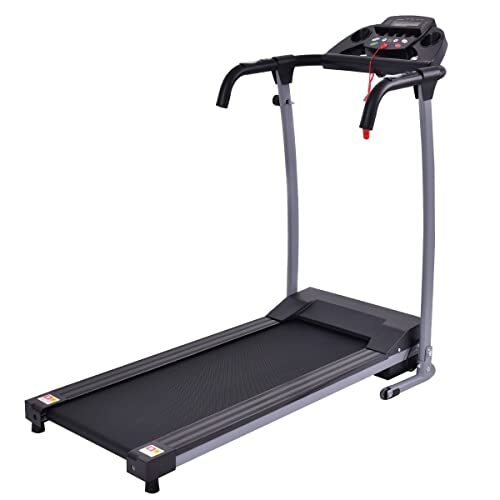 People who are primarily using a treadmill for slower paced jogging or walking could be able to safely use a treadmill that has a width of between 18 and 20”. The incline settings are a key feature that many users love to use while working out. They add a more challenging element to your workouts by making it feel like you’re going up a hill. As a result, you’re able to burn more calories faster. Nowadays, most cheap treadmills under $200 offer an incline feature. Some of them can go all the way up to a 12% incline. Depending on the brand, the incline settings may be automatic or manual. An automatic incline feature means you can set the incline and the treadmill will start to move into the desired position. On a manual treadmill, you’ll have to stop your workout and adjust the incline before getting back on. Having said that, you should know that it’s common for cheaper treadmills to have no incline settings altogether. Before purchasing a treadmill, it’s a good idea to be aware of the maximum weight capacity. If you’re above the advised weight limit, using the treadmill could be dangerous. Elderly people or those going through rehab may want to stick with the best cheap treadmills that have longer side rails. They provide you with plenty of support which you may need to keep yourself balanced. Side rails are something that comes as standard with the best cheap treadmills, but some may be longer in length than others. Those are the ones that would suit people who struggle to balance best. The Goplus 800W treadmill has been created with high-grade steel materials. Therefore, the construction is incredibly strong and it can take a maximum weight capacity of 220 lbs. The running belt is a total of 38.2” x 14” in size. So, walkers and joggers may find it to be the most suitable. It keeps you stable and safe while walking or jogging. It’s equipped with a Space Save Design system. This allows you to easily fold the treadmill up to a more compact size. In addition to the folding feature, there are also wheels located on the bottom. Therefore, you can transport the treadmill in and out of storage easier. As a result, the Goplus 800W has been among the best folding treadmill reviews among customers online. If you enjoy using devices, such as tablets or smartphones, while you workout, the holder available may be something you’re interested in. It enables you to easily place your device in a holder to watch TV shows, movies, or anything else. 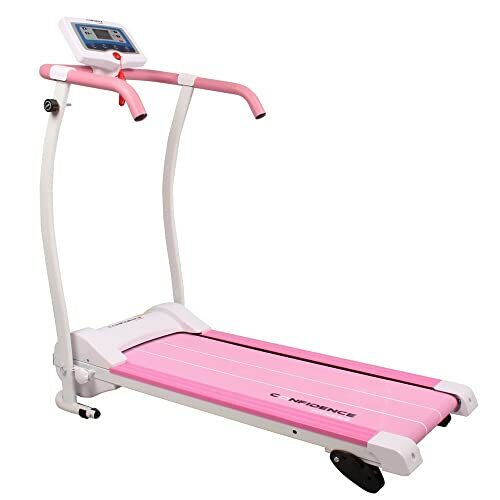 The safety key that’s included with the treadmill is something that users may prefer to have while working out. 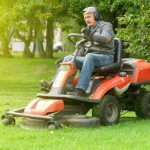 It improves the overall safety of using the treadmill. You simply connect it to yourself as you workout. If you slip or fall while on the treadmill belt is still moving, the safety key will unclip from your body and automatically turn the entire system off. An emergency stop button is also located on the handrails which provide you with another safety option. The LED display shows you information based on your workout statistic. This includes your speed, heart rate, distance, calories, and time. It can be a useful tool in ensuring that you can keep track of your progress to improve your fitness. 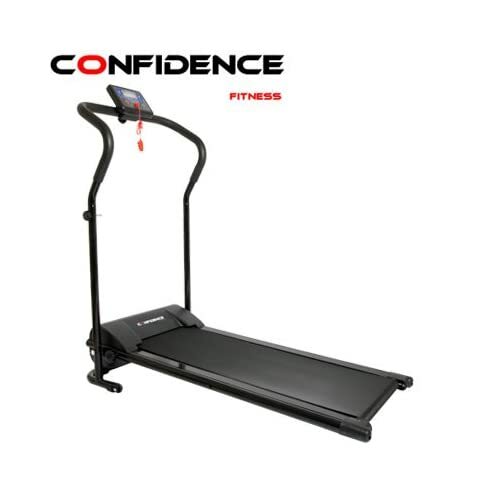 The Confidence Fitness Magnetic is among the popular cheap treadmills under $200. 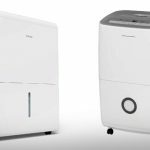 It uses a magnetic resistance system has proven to be incredibly quiet and smooth. This may be a good benefit for people who need to workout without creating noise and disturbing people. There is a total of eight different resistance levels to choose from. Therefore, you’re able to select the best one depending on your workout needs. The higher the level, the more challenging the workouts will be. With a fixed incline position, the difficulty levels of your workouts are already increased. Through my experience of using the best cheap treadmills with the goal of losing weight, the harder it is, the better the results will be. The computer display system provides you with data on your workouts. This includes the time, distance, speed, and the number of calories burned. It’s a useful tracking feature that helps you to know where your fitness levels are and where you need to improve. If you need to move a treadmill around without any hassle, you’ll appreciate the wheels and locking pin system. It lets you fold the treadmill up securely and roll it around to a more secure location for storage. 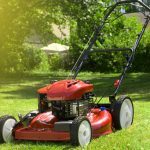 It allows for a maximum weight capacity of up to 220 lbs. I also recommend it for people with shorter strides. This is because the belt is 39” x 14” in size. So, people with longer strides may struggle to use it comfortably. The Goplus is among the cheap electric treadmills under $200 which has a lot to offer. It runs on a 1 horsepower motor. It’s high-quality and allows you to workout without creating any noise. I found this to be a good benefit if you’re in situations where you need a quiet way to workout. I remember trying to work out with a treadmill early in the morning – it was way too loud and would wake everyone up! 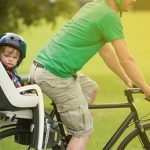 It allows for a maximum user weight of up to 220 lbs. So, most people will be able to use it comfortably. 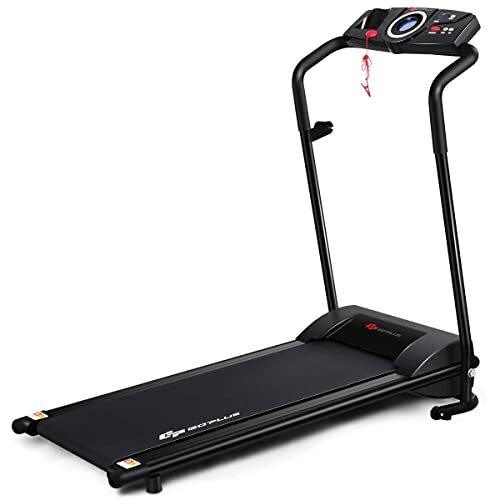 This is another Goplus option that’s been gaining the best folding treadmill reviews from users. There is a Space Save Design which enables you to transport the treadmill for home use without any hassle. When fully set up, it’s 46 x 20 x 42” in size. Once you fold it down to a more compact size, it’s just 9 x 23 x 51”. The smaller size combined with the wheels on the bottom means that you can move this treadmill to better-suited storage places while it’s not being used. People with smaller living spaces may appreciate this feature the most. With a round display, you’re able to clearly see your distance, speed, time, and calories burned. You can also choose between a total of 12 different workout programs by navigating through the display. The Confidence Power Trac Pro is among the range of cheap electric treadmills under $200. It has a motor of 600W which means you can use the treadmill at speeds anywhere between 0.6 and 6.2 mph. These speeds may be more geared towards walkers and joggers. You’re given the chance to select between a total of four speeds which have already been set for your convenience. These speed settings include 1.86mph, 3mph, 4.9mph, and 6.2mph. There are also 12 workout programs to choose from. This gives you plenty of options to be able to select the one that aligns the closest with your workout goals. With an LED display, you can see your time, distance, speed, and calories burned in one place. This makes tracking your workout progress a lot easier. 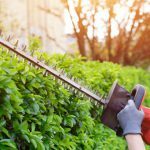 As a result, you can identify the weaker areas and work on improving them. The incline mechanism available has three levels. They include 5, 3.5, and 2 degrees. These allow you to add a more challenging aspect to your workouts by making it feels as though you’re going up a hill. Having these adjustable incline levels on a cheap treadmill under $200 is pretty rare. Users have noticed that there are wheels located on the front of the treadmill. These can be helpful in situations where you need to move the treadmill. To allow for easy storage and portability, this Confidence Power Plus Electric was created to be a folding treadmill. 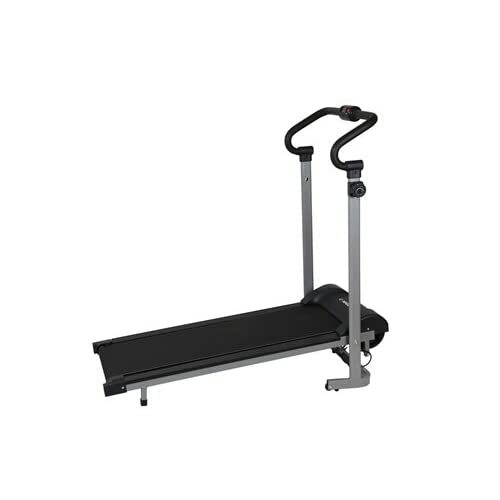 This allows you to move the treadmill around in a more compact size that’s easier to deal with. The LED display is clear and shows you all the information based on your workouts. This includes the time, calories burned, distance, and speed. As a result, you’re able to see your progress in clarity. This is a simple but effective feature that can help you see where you need to make improvements to carry on excelling. It’s among the range of cheap electric treadmills under $200 that’s powered by a 600W motor. This lets you work out of speeds between 0.6 and 6.2 mph. This is a range that can suit a variety of people. Regardless of your workout experience, you can use the speed that suits your fitness levels the most. Moreover, it can handle a maximum weight capacity of 265 lbs. Therefore, most people will be able to use the treadmill safely. Before committing to purchasing a treadmill for home use, take the time to consider how you’re mainly going to be using it. 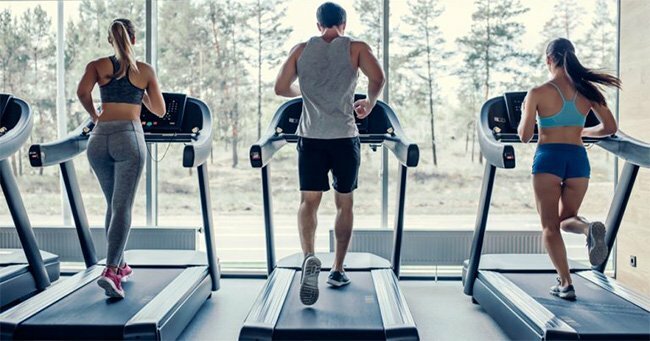 This will help you to narrow down your search and pick out the best cheap treadmills under $200. I have been using Goplus 800W for 2 years, it works very well, but I still want to buy another brand to experience.